Ski: DPS RP 112 Pure, 178cm, mounted +2 with Dynafit Speed Radicals, no brakes. Review below. Me: 160 lbs, 5’6″, former racer, now backcountry skier, neutral stance, size 26 boots, aggressive style. The skis look Clean, light and aesthetic with the Speed’s. The yellow top sheets have a slight texture and do not accumulate snow sticking like my Dynafits did with the black smooth tops. The finish is clean, and they look well built, more like a Mercedes than a Ford. The tops seem to resist scuffing and scratching, but can get nicked if you whack them on a kick turn. They weigh 1800 grams each, which seemed heavy at first compared to my Manaslu’s but now, with the width for deep powder, don’t seem heavy at all. All the other light skis at 112 are at least as heavy including the Dynafit powder models. DPS makes their skis in the US from carbon fiber. The skis have low camber, slight reverse rocker at the tip in the spoon, and a side cut behind the whale tip. They are soft skis and flex well. 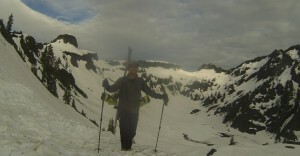 They are 95% powder skis and do very well in ankle to waist deep powder. 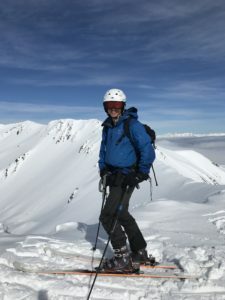 I skied them on BC hardpack, BC 1 foot settled powder, Hokkaido Japan waist deep powder. Read the DPS site carefully on mounting instructions. The authorized dealer I bought mine from did not have a clue. He mounted them on center, and they skied like crap. They just slid on hardpack and would not carve. They chattered almost uncontrollably on hard windpack or ice, and were very difficult to ski powder. I had to lean way far foward in an unnatural manner, and if I got neutral, they would throw me back, and not allow regaining forward control. Turn initiation was very hard. So after almost selling them, I talked to a guide from Revelstoke who said, All the guys and shops there are mounting +2. I did, as 2cm is minimum for a remount, and its made a world of difference. They are now without a doubt the best powder skis I have ever ridden. They intiate turns very easily and have super control in tight trees. They can handle speed on the cream powder with authority. 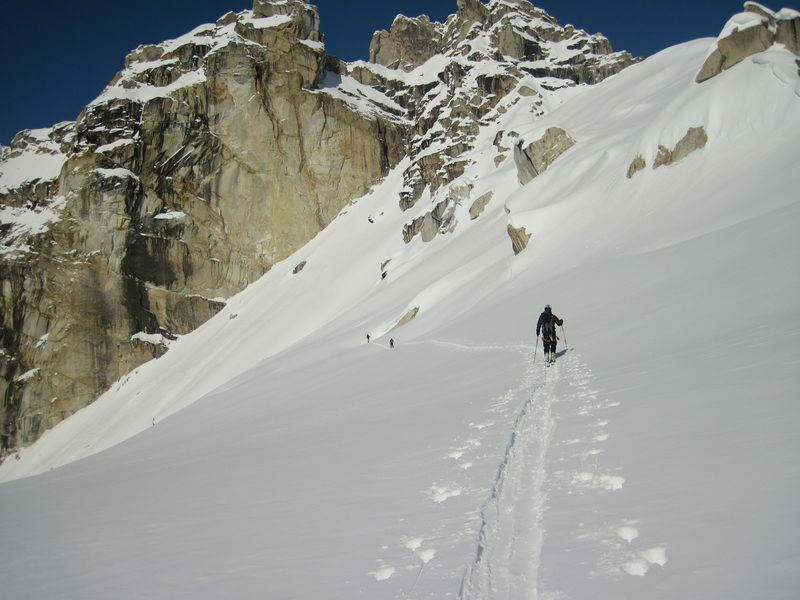 They carve on the piste with accelleration, but at speed wander on hardpack due to low camber and soft flex. They ski shorter than their length as the front has the modern spoon in front with the side cut starting about 1/4 way back from the tip, and the tip being a spoon. Floats great in waist deep blower pow and due to low rise tip forward resistance is low. 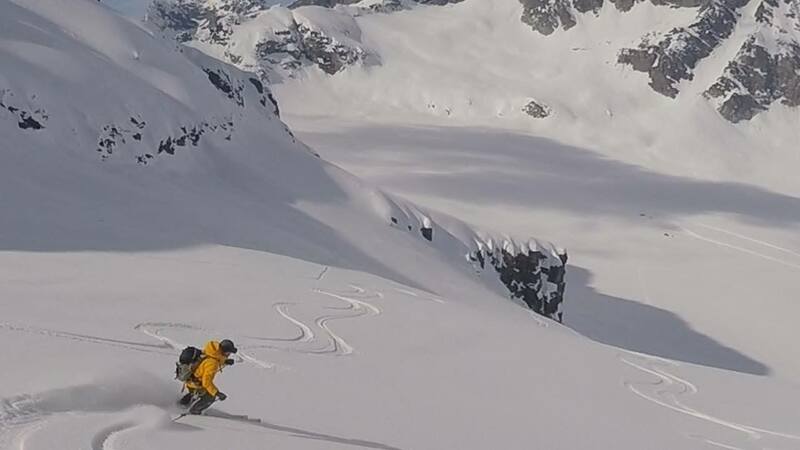 Can ski backwards easily due to tail rise. 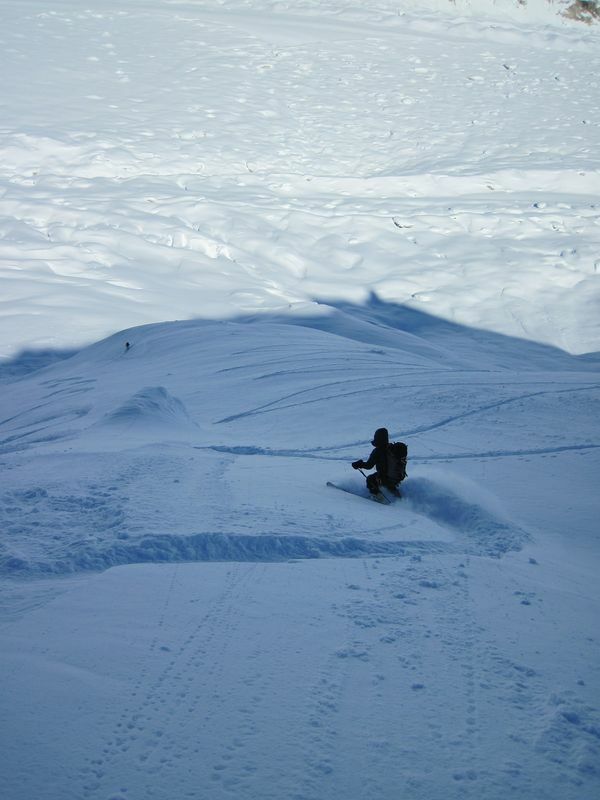 Once I did ski into a drift at the bottom and the flat tips dove in, but only on the flats at the bottom of the steeps. They are easy to sit back and bring up the dips if the pow gets heavy. The tail feels a little long on the kickturns if you can’t bury your tail in the pow on the turn. Get 2 or 3 coats of good wax on them before you go out the first time. World of a difference. The factory ptex has a texture on the bottom that might need to be stone ground out at the shop first and makes a buzzing sound. Wax really helps, much faster, much better turning. I have G3 skins on them. The tails don’t have an indent for the skin clips, but I haven’t had a problem with them slipping off. They need a real good wax job out of the shop with trip wax to fill in the base grind texture. I think a full base grind would help avoid the new ski buzz due to ptex texture. The Ptex is hard. The edges go all the way around the tip and tail for good protection at a slight weight penalty. 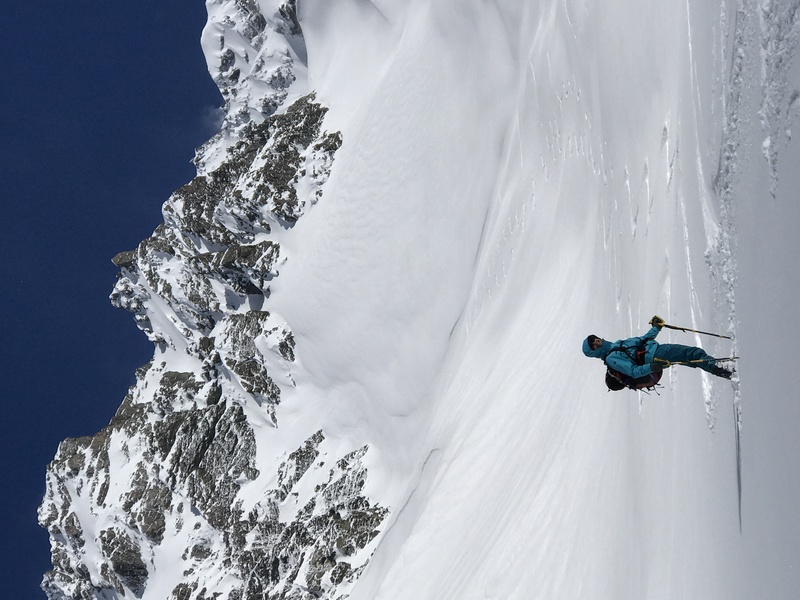 These are a great 2nd ski for deep pow, but would require a narrower spring/ice ski. Great for a quiver. They are not very good on ice or hard hard windpack. Before I moved the binding forward I got bad chatter on ice and hard hardpack. Hopefully not so bad with the bindings, but I’ve only skied deep blower powder since the move. 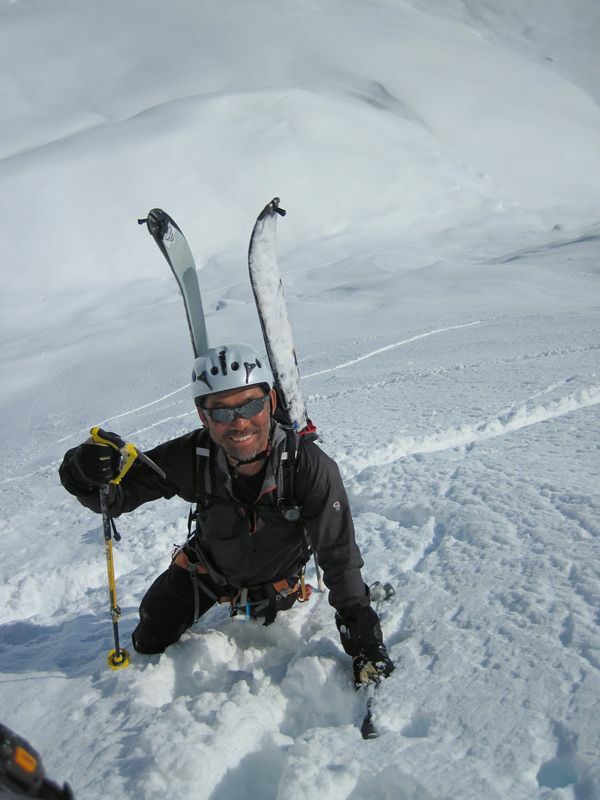 I did notice the guide in BC who had the Rossi S7’s also getting a lot of chatter on his skis on the steep icefall face. 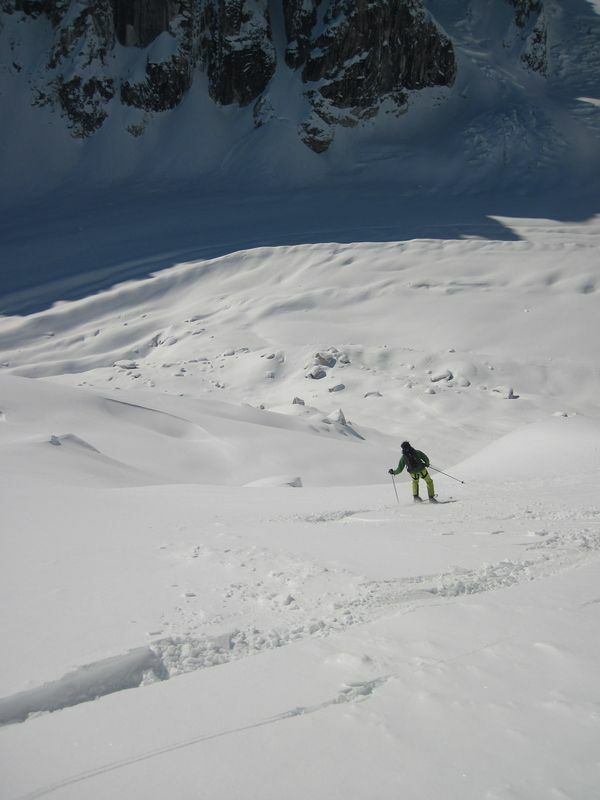 I flew in early December 2013 to the Kootenay Range in British Columbia after 26″ of new powder snow fell. It was cold (-14F! ), calm, clear and sunny. The early season powder was great. The people in Nelson, BC were the friendliest of any town I have ever been to. 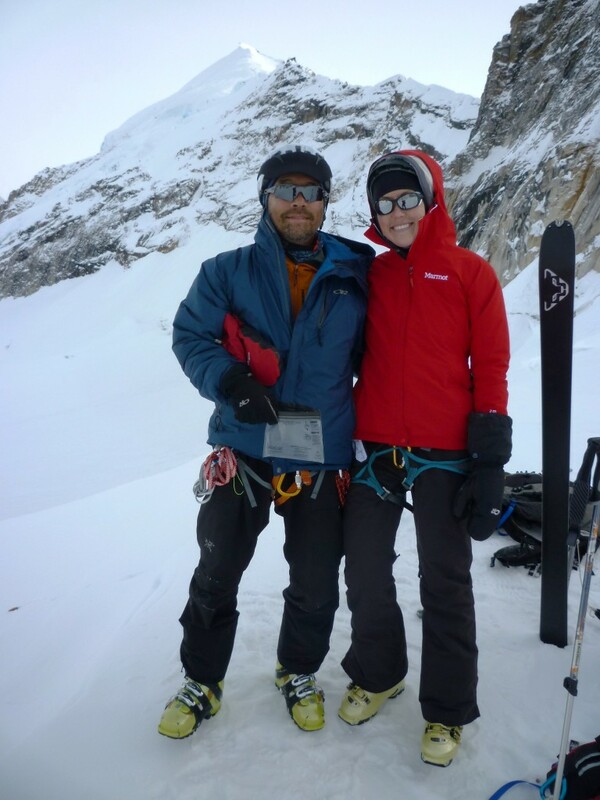 Men were strapping, the women slim, attractive and stylish despite the cold weather gear. Lots of families and young kids. Great town, good food, nice ski shops. 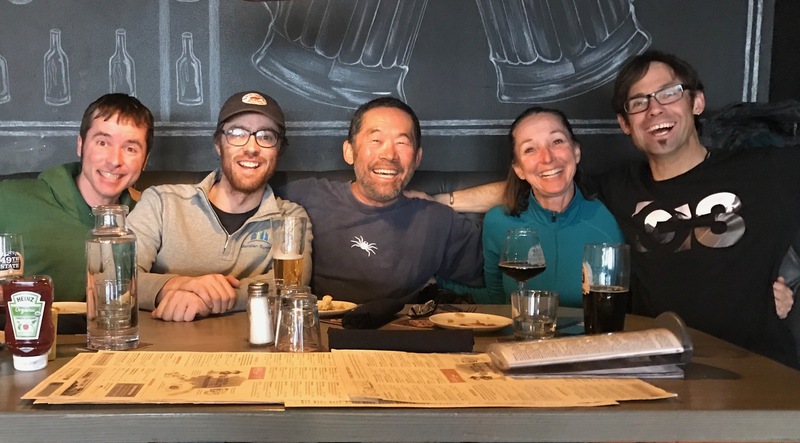 I had originally arranged to stay at Wildhorse Lodge http://www.backcountryskilodge.com/ run by Trevor Holsworth and made plans to travel to British Columbia Canada from Hawaii based on Trevor’s promises. Unfortunately after I arrived Trevor says, “Sorry my plans changed, you can’t go in. I don’t feel comfortable having you back there alone.” What? Too bad he didn’t mention that before I flew from Hawaii. Pretty flaky! Some of the locals were talking about his unreliability. Last year when we went in, he had a flashlight strapped to the snow machine, and he dumped the cat in a ditch stranding us and another group until late at night. 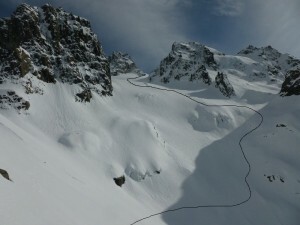 So plan B was to ski some Whitewater area backcountry lines and stay in Ymir and Nelson hotels. So things worked out well, even though not as planned. 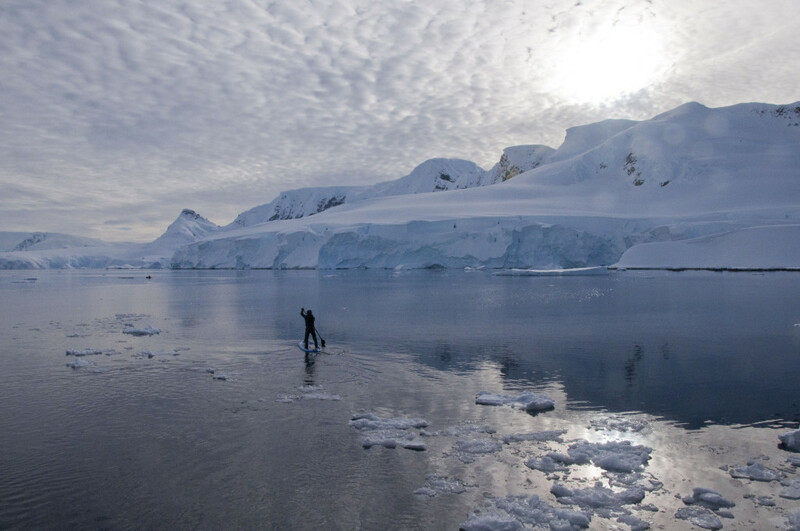 We skied Antarctica! But it was an adventure to get there. On our way from Hawaii, just as we arrived at LAX terrorists opened fire 800 feet from us. We had to hide from the police state at LAX to get to the international terminal as there was a total lock down for hours after the emergency was over. 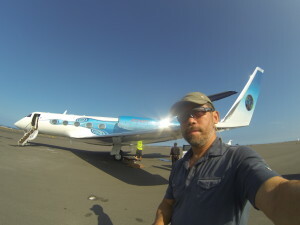 I was really worried about missing our connection ,so I had to sneak by all the cops, phony security idiots. They were real idiots. Finally we got on the plane, but it was delayed by 8 hours. Luckily we had a 11 hour layover in Lima so we caught our connection. 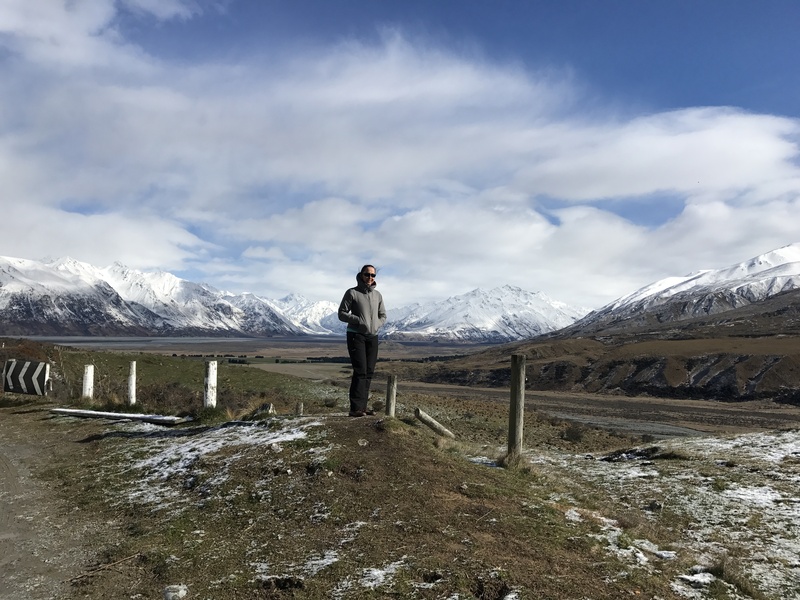 It took a full 6 days travel by plane and boat, 12,000 miles, 3 continents, 52 hours crossing Drake Channel below Tierra del Fuego, through hurricane force winds, thirty foot seas. Its the closest thing to another planet on Earth. 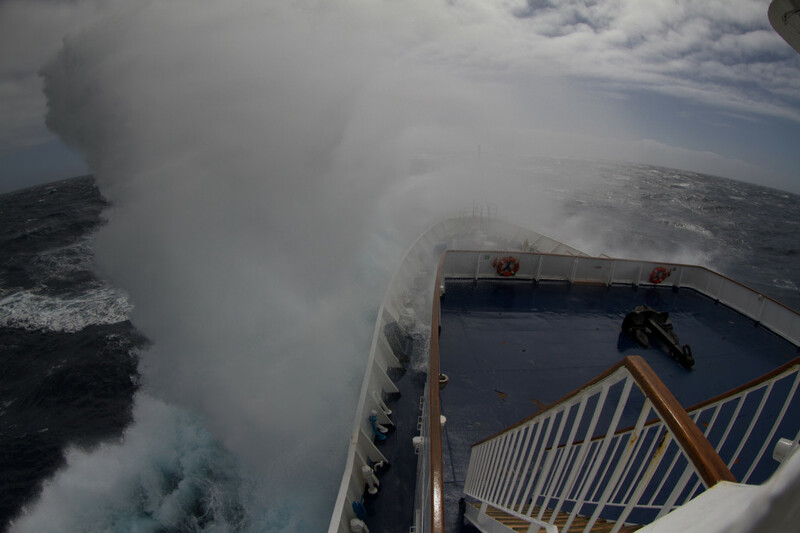 The Drake Channel had 80 mile per hour winds and thirty foot seas. 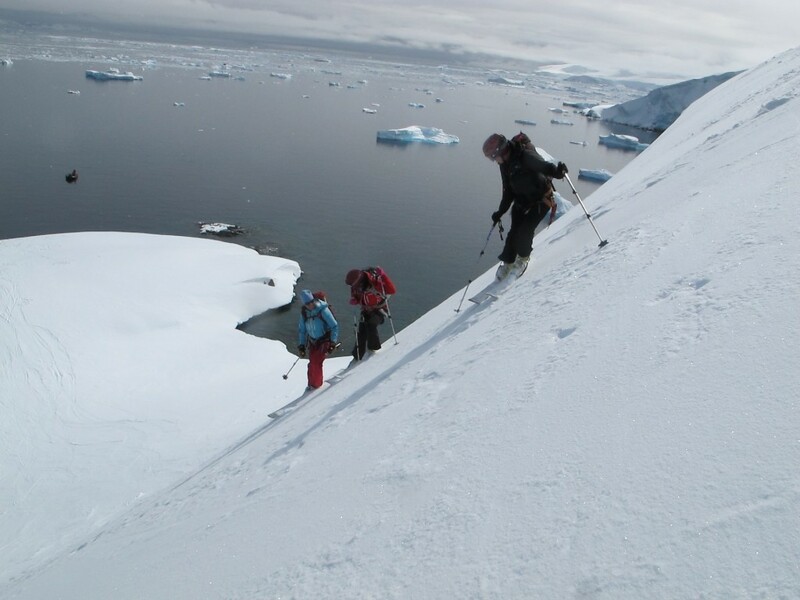 First day, first summit of Cuverville Island. We climbed four mountains. 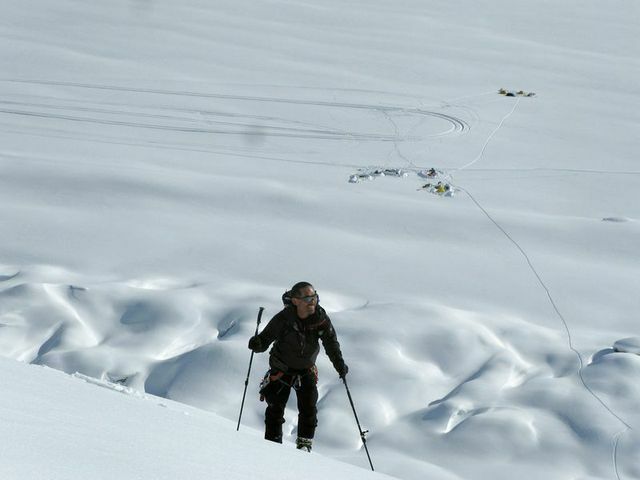 Two were first ski descents. We had beautiful weather. The people on the ship were world class athletes and famous ski movies stars. 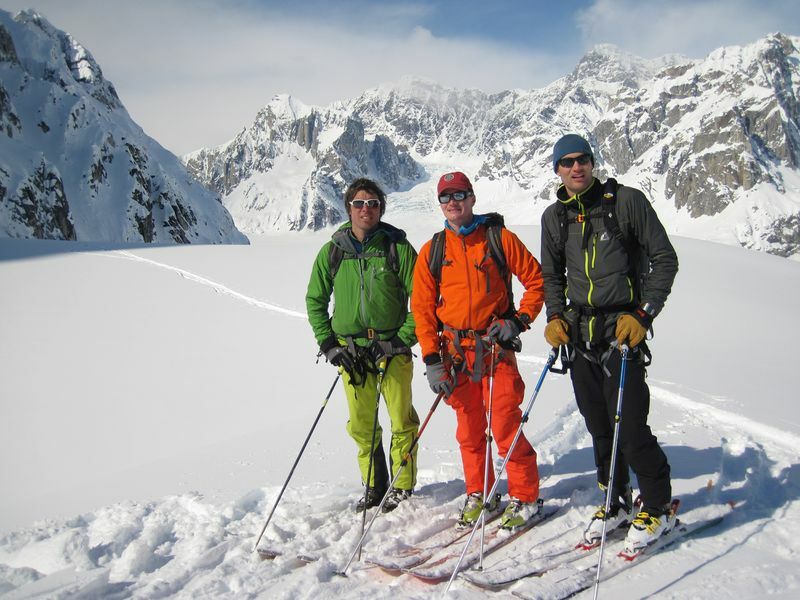 Everyone was very friendly and we made good contacts with the top ski guides in the world from Argentina, France, Sierras, Alaska, Tahoe, Aspen, Sweden. 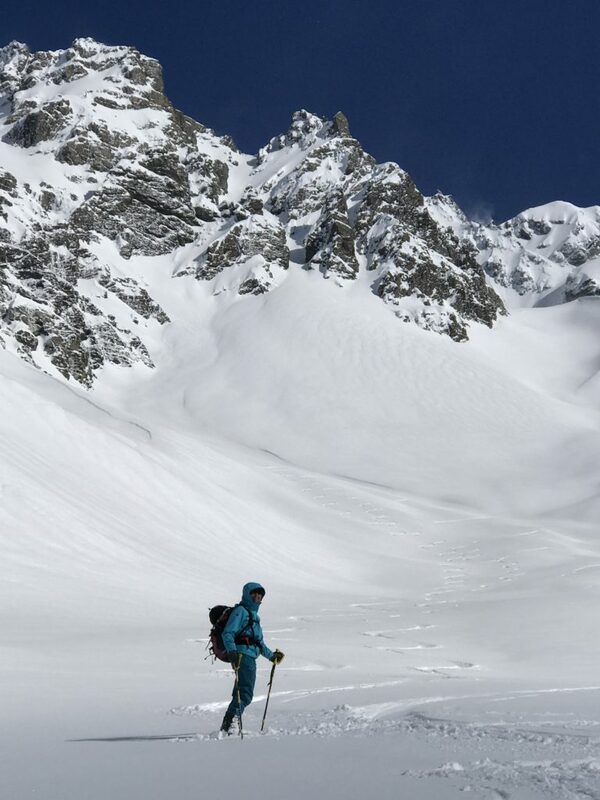 Due to the remote location, risk was dialed back, though there were some steeps. 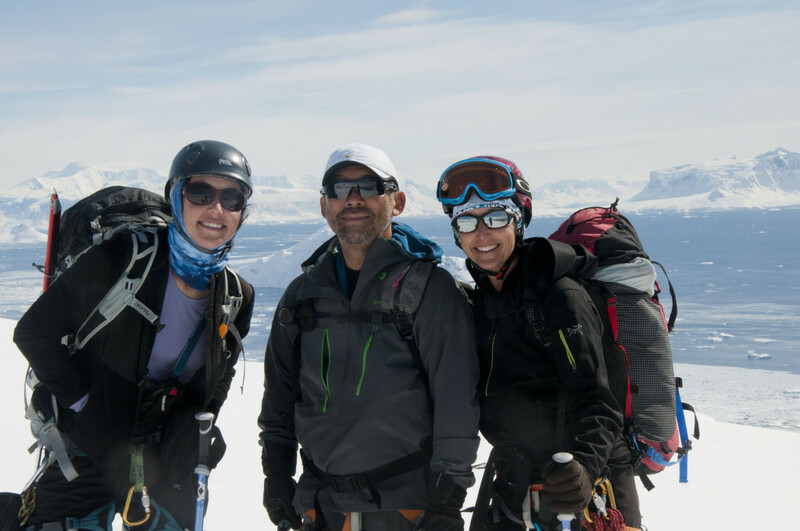 Kim and Sarah ski some steep terrain with professional skier and movie star and guide Kim Havell. There were some burly lines. It was really wonderful to spend time with our daughter Kim who is a Phd in Chemistry at Berkeley. I am lucky that both Sarah and Kim are both chargers and can shred the gnar. I even got to Stand Up Paddle!!! Don’t fall in. The water is -2C. Staying on board the ship was comfortable, the food was great, and it was fun to meet new people and make new friends. Everyone was very friendly. The 15 Russians drank lots of vodka and were boistrous. There were Swedes, Irish, Scottish, Indians, movie stars, deep sea divers, surfers, guides. 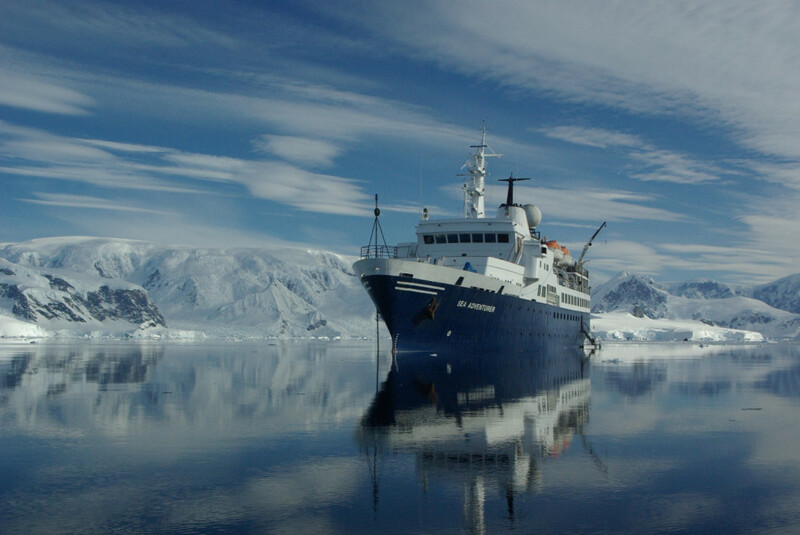 The Sea Adventurer is 310 feet long, solid, well appointed and run by sold people. Ice pack blocked our way to a number of the southern objectives. 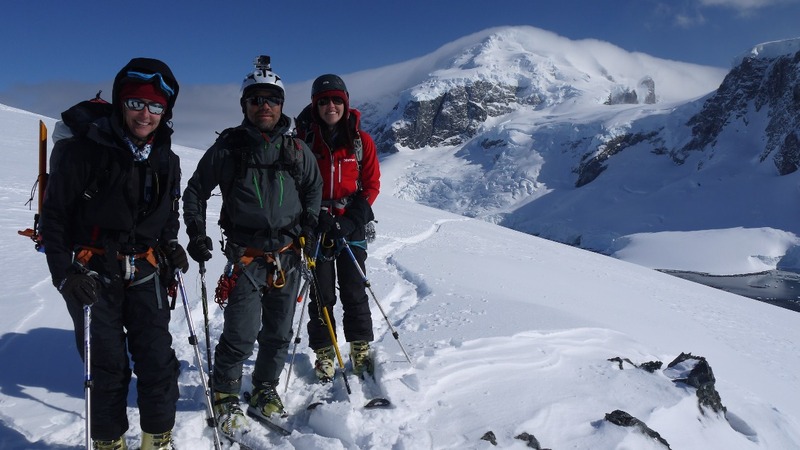 Sarah got to ski with famous ski stars Andrew McClean and Chris Davenport. Both were super nice guys and we got to talk to them on the boat. I even got to ski with Chris Davenport one day. That was my dream. 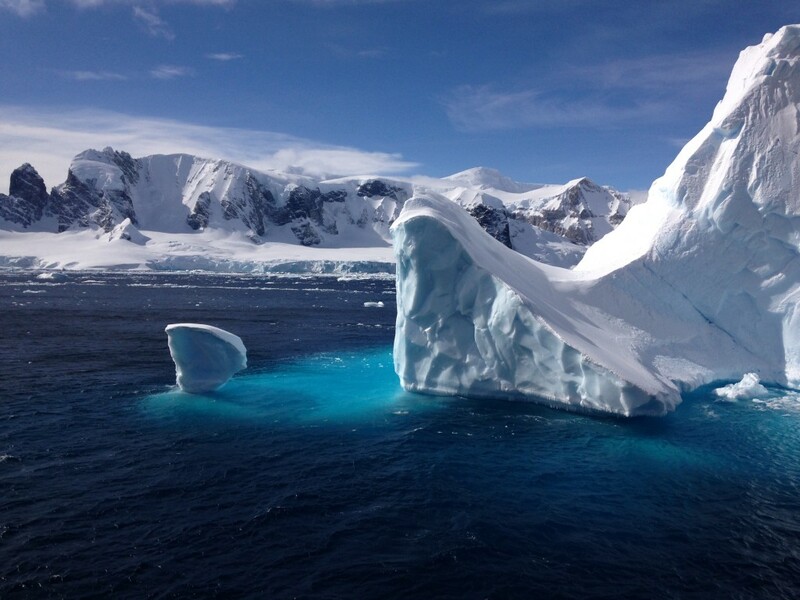 Bye Antarctica. Will I see you again? 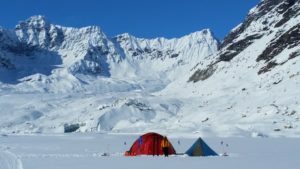 We set up camp in the middle of a mid sized glacier surrounded by 5000 foot towering spires, rock faces, steep couloirs and epic power bowls of such immense proportions that the mind cannot grasp it. The temperature was 15 degrees F, wind calm. 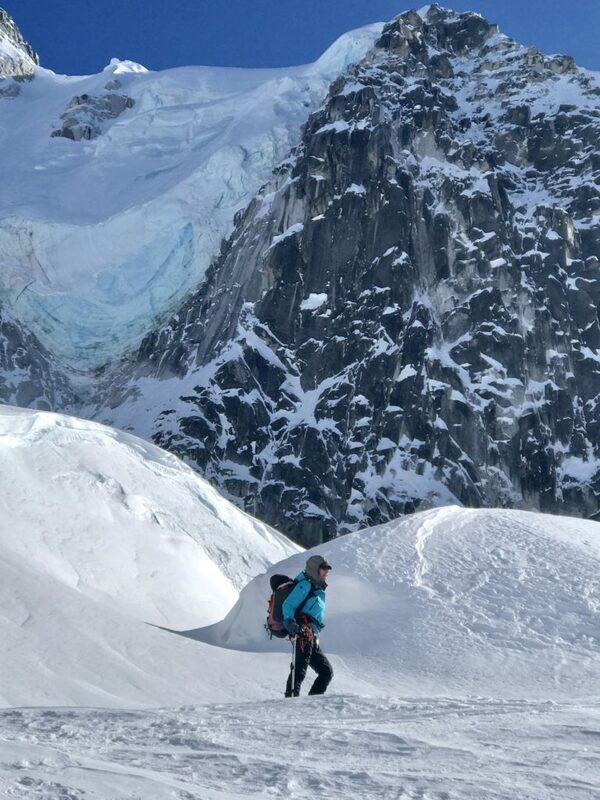 Nearby on the glacier was world famous climbing team David Lama from Chamonix, France along with an Austrian doing first ascent routes up 5000 foot walls. You’ll read about them in the climbing magazines soon. 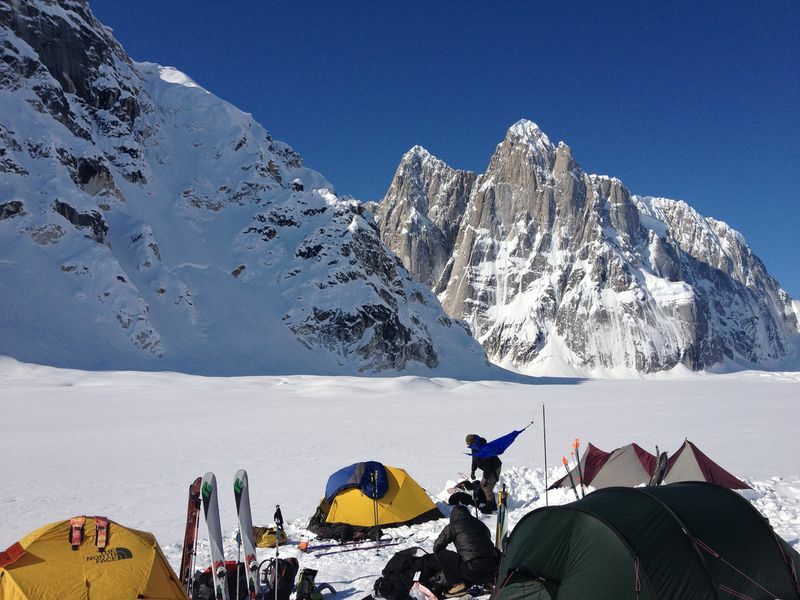 After setting up camp, with sunlight perfectly lighting up our valley until after 9:00 pm and light until after 10:00 pm, we had plenty of time to check out our new surroundings and get some turns in. We headed up “Camp Tech Hill” a south facing bowl about 1200 feet to the cliff line. 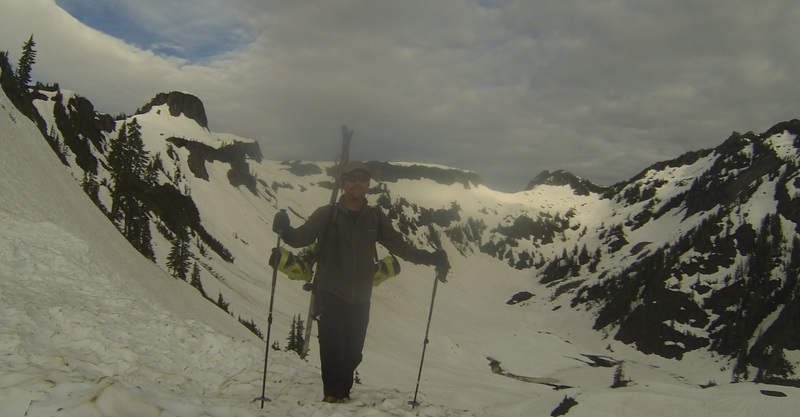 There was very little natural activity from the previous snowfall of a foot with minor sluffing off rock bands and a few crowns on the cliff which we avoided. Cautiously we dropped into some nice creamy AK powder turns down the 30 degree slope. After a great run, we headed back to camp for evening refreshments and dinner and the well appointed, warm comfortable cook tent with seats, and well stocked bar, and Mango Margaritas. That night, the katabatic winds of about 12 knots made the temperature -20, but my -10 rated Feathered Friends bag inside a Hilleberg Nammatj 3 double wall tent kept the cold and wind at bay. The next morning broke early cold and clear. Sunlight warmed our well situated camp from sunrise to sunset. 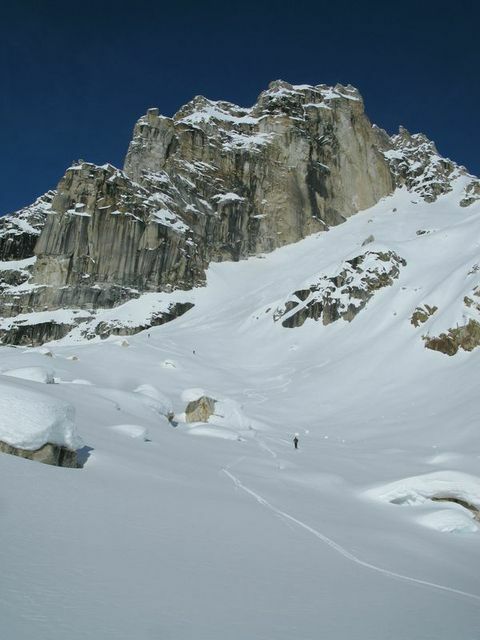 We chose an objective with a north exposure where the powder was the lightest and headed up the “Caveman’s Revenge” Couloir with about 50+ degrees at the crux. I wished I had my verts or ascent plates. We got some sweet fluffy powder turns. It was so much fun, we headed back around the corner to “Po po pow pow” ridge for a couple of sprint up fast laps the left the thighs and lungs burning but were rewarded with fast dreamy powder that was rippable and perfectly smooth. 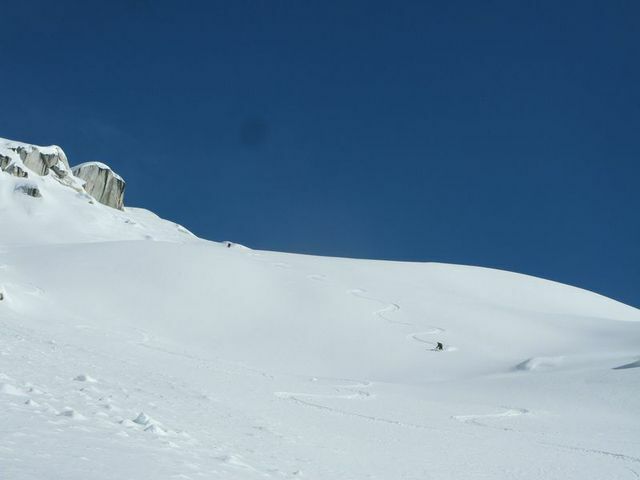 There was no avy or crevasse danger at all. The next day we planned to go big and headed for the big objective we could see from camp which we called, “Aloha Tower”. 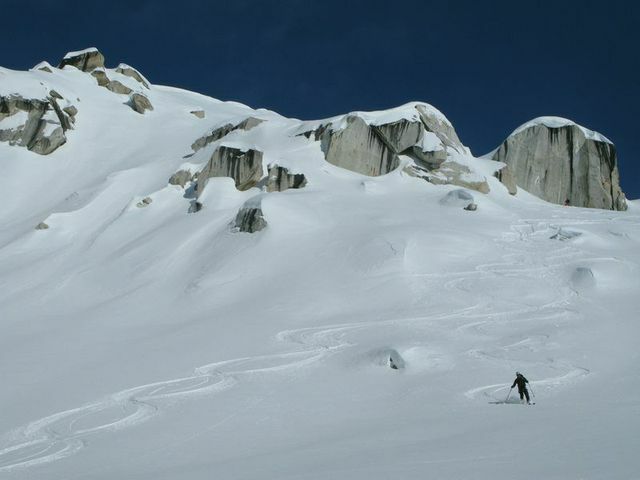 We headed up what turned out to be a large bowl with interesting chutes on the sides filled with smooth powder. We topped out at 6500 feet for a 2400 vertical after a 2.5 mile approach. 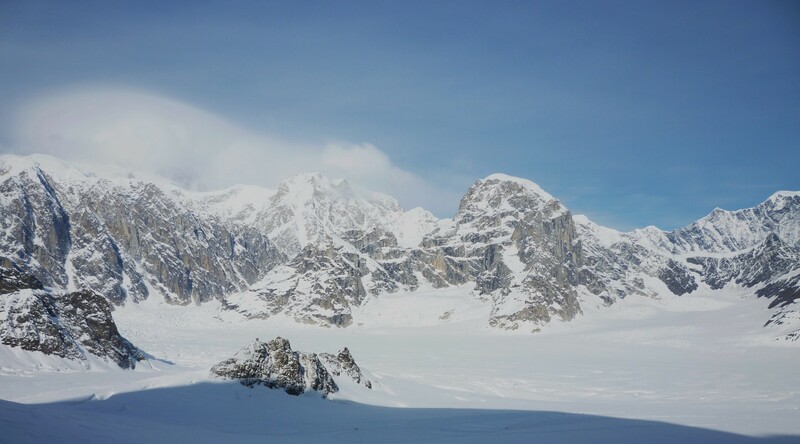 Denali towered in the distance. Wind slab at the top and cornices made it a bit sketchy when the slab cracks shot out for 15 feet in all directions skiing down, but luckily it was on the low angle before the roll and did not run. The rest of the run was about as good as it gets in the backcountry…big open steep bowls with consistent angle and perfect snow and light. The light hit the slope at a perfect angle just kissing the surface of the snow for good visibility, but not warming the powder keeping it soft. 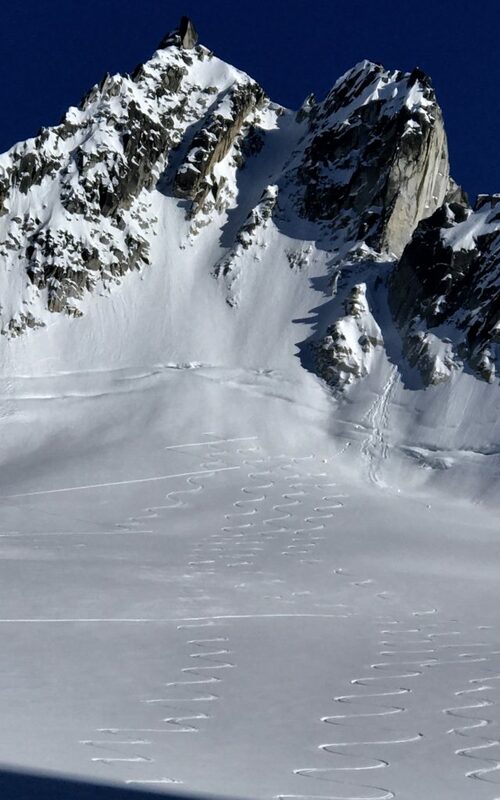 You could see your shadow while skiing and the powder billowing behind. Eli admiring our sweet tracks down the Aloha Punch Bowl from across the valley. 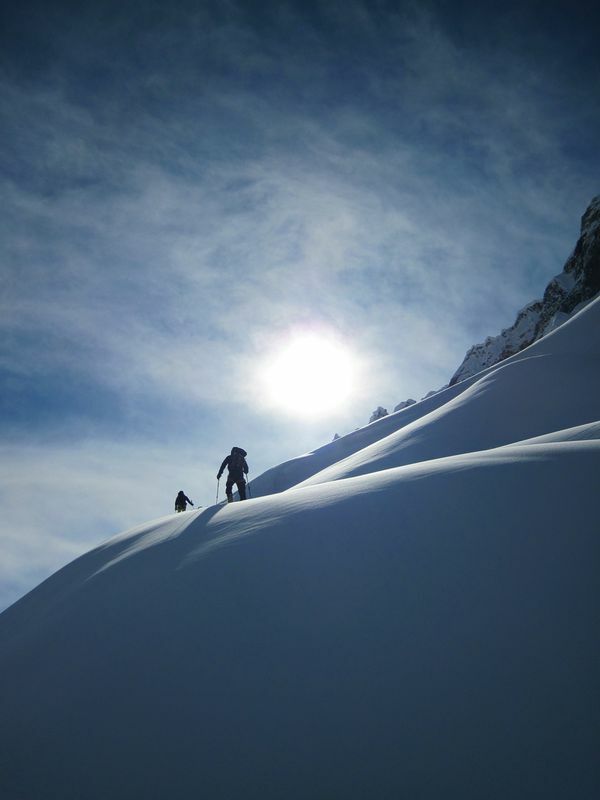 The next day we explored a high cirque and mountain feature which turned out to be an even bigger day. 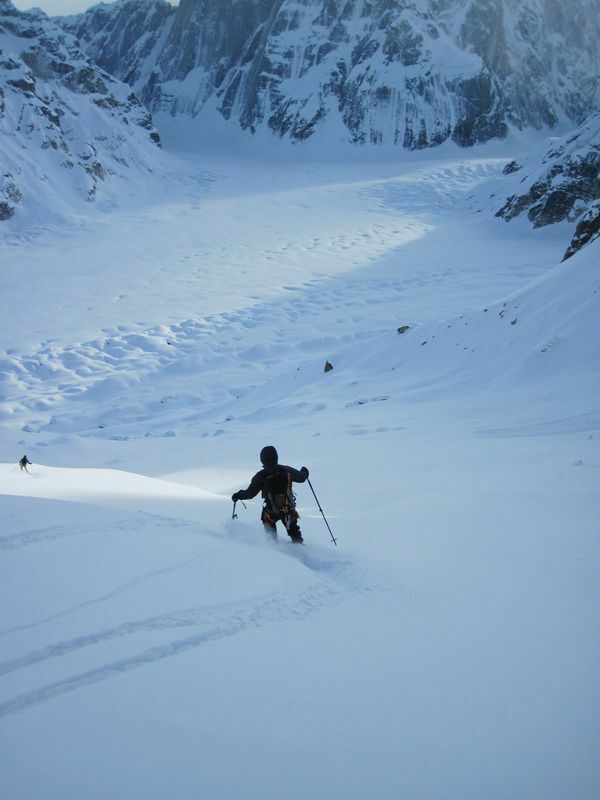 After skinning up to the cirque Eli asked, “Where do you want to go, up the couloir or up the valley?” I voted for the “Justice Couloir”. It was 45 degrees so not too scary and with solid snow, we booted up to the top. 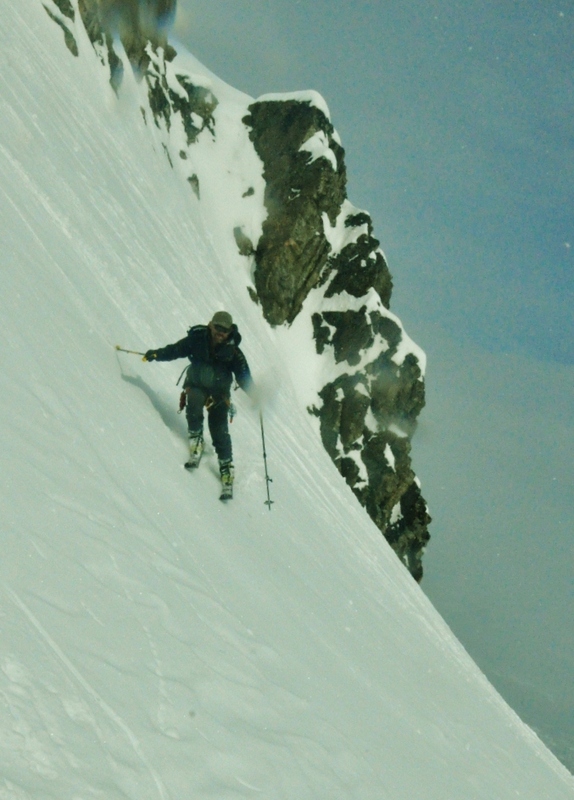 The couloir was a sun affected so we continued exploring over the top in the high snowfields. We were a bit uncertain whether we would connect to the bowl or get cliffed out. Its real adventure. 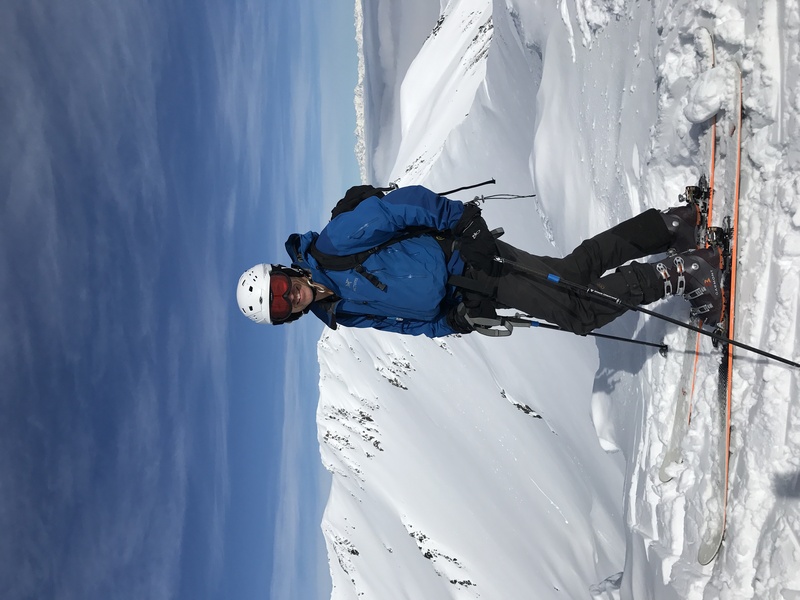 Eli has a masterful sense of mountain topography and snow and led us over the top to an absolutely stunning epic bowl we named the “Law and Order” bowl. 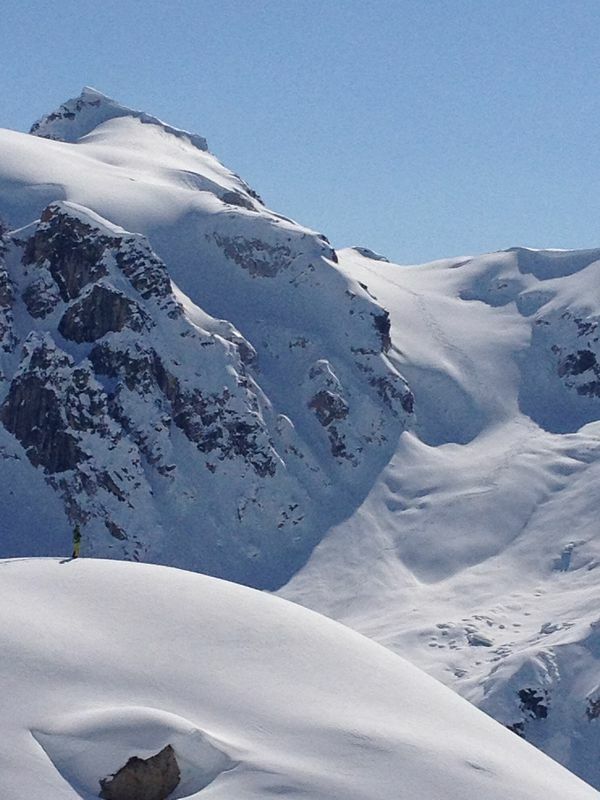 A huge 700 foot solid sheer cliff towered ominously over the bowl run. Huge overhanging seracs hung above the opposite side of the valley. This is as big as it gets. The large scale thigh burning powder bowl encouraged wide big arcing turns. Approaching and skiing the “Law and Order” bowl. 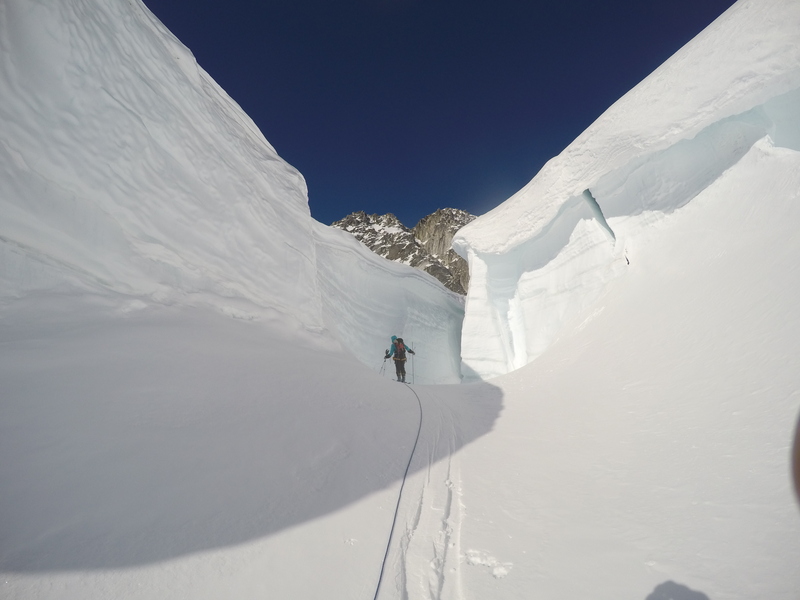 Eli chose this amazing line back through the huge glacier crevasses and ice falls and we glided all the back to camp exhausted. Our last day we headed back up the Camp Tech Hill in hot hot sun and scored some perfect corn, packed up camp and headed home. Go big, and go home! All safe, no injuries. The worst injury was sunburn on the bottom of my nose from reflection up from the snow and aching sore muscles. The colorful ” Hawaiian Connection ” team of head guide, Eli Helmuth of Colorado, Assistant guide, Dave Burns from Wasilla Alaska, and Nate Thorell of Boulder. A solid team. and tramp about in a 4×4 camper van. 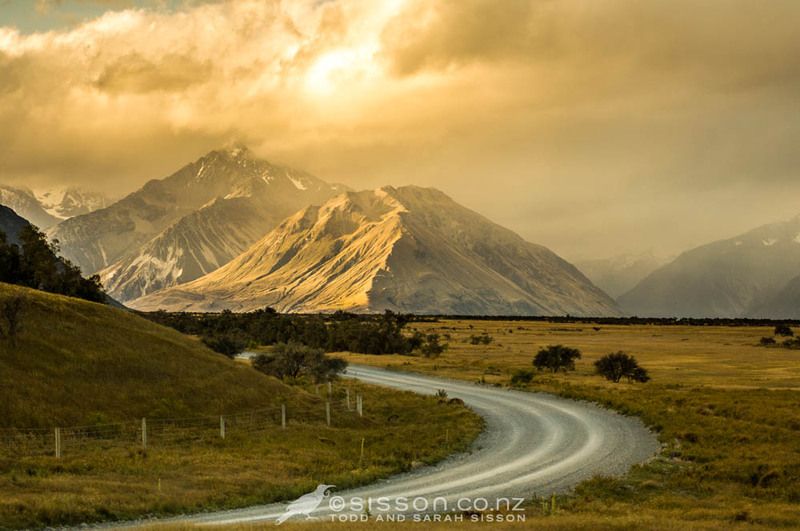 Mount Erewhon is the first ski objective located where they filmed Lord of the Rings, Two Towers which in the movie was called Edoras, Rohan. Its an abandoned heli ski field with a road up for good access and a nice lodge below. Its a beautiful location. 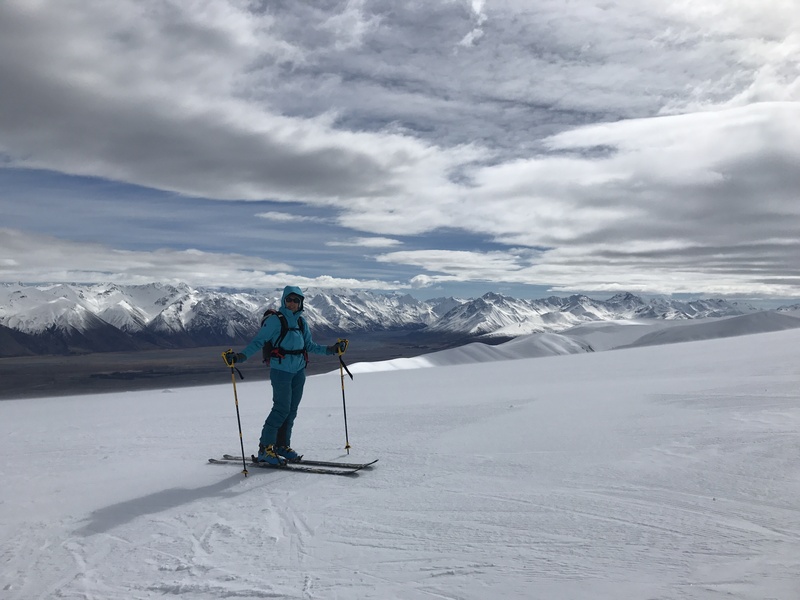 New Zealand has huge backcountry ski potential and it snows in August and September which is winter down under. It sounds safer with less crime than South America and the airfare from Hawaii is cheaper. There are huts and club cabins in the mountains to stay at. Some provide food as well. Prices are modest and the currency exchange is good. 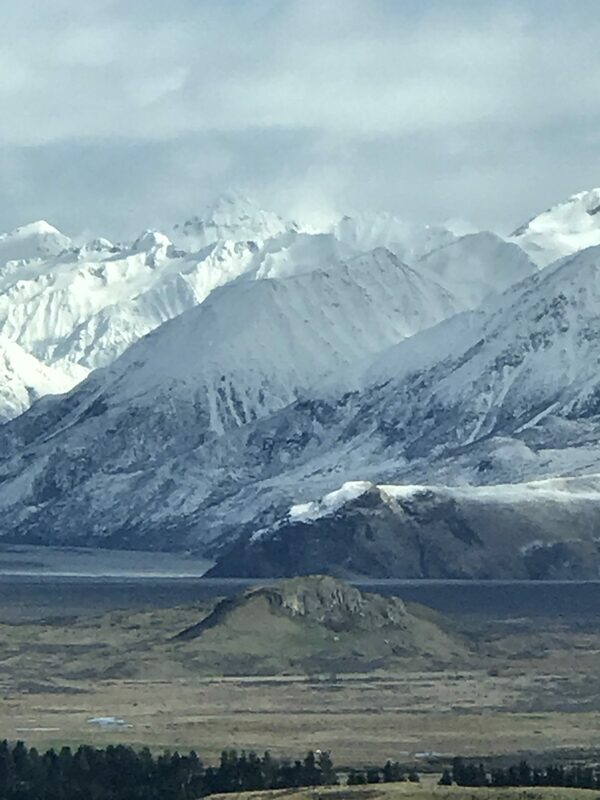 The island is accessible with mountains 3 hours away from the coast. Its the ultimate surf-n-ski destination. 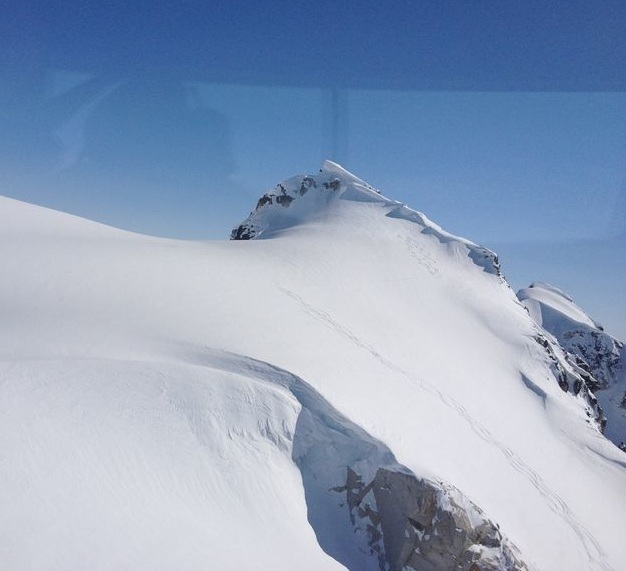 Another spot with good snow cover currently and good backcountry potential is Treble Cone in Wanaka. 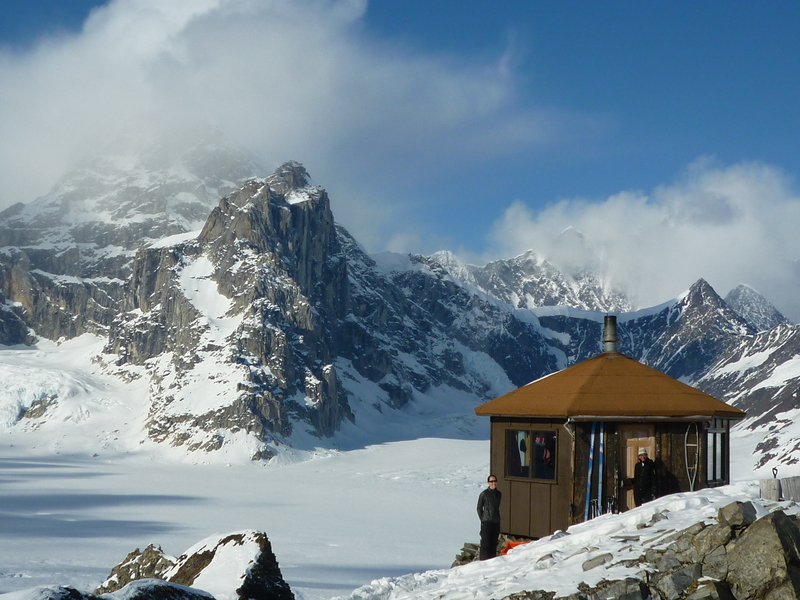 Kai Tarau is another beautiful ski objective near Mt. Cook. 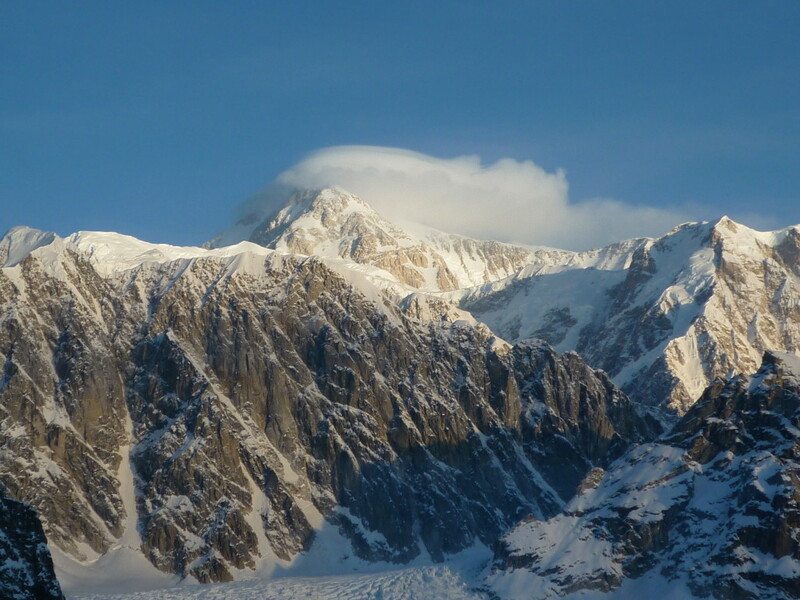 Its a 4K walk in, which is not bad and I’ll set up a basecamp at the bottom of the bowl. I have a good surfing buddy who lives in Dunedin at an epic surf spot called Murdering Bay with an epic set up like Malibu but with few folks out. I’ve known him and his family for 30 years and will go visit him. He’s got a cool house overlooking the surf spot. I had an unexpected opportunity to go ski Mt. Shuksan in the North Cascades of Washington State. Flew with friends to their idyllic place in Puget Sound, then headed north near to Mt. 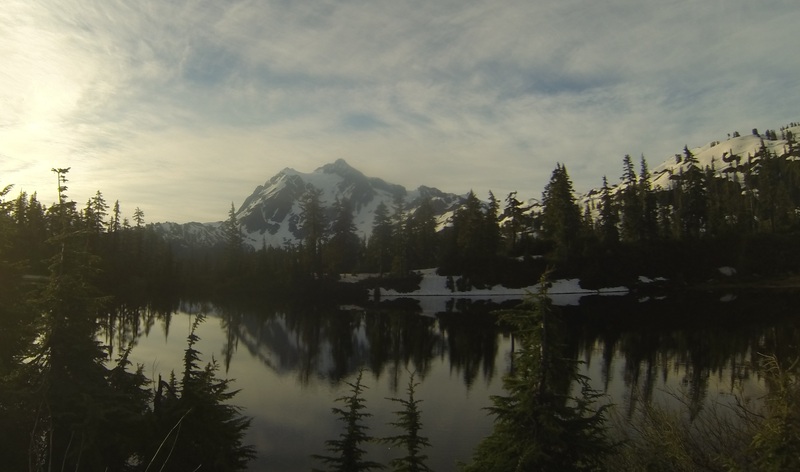 Shuksan in the North Cascades National Wilderness near Mt. 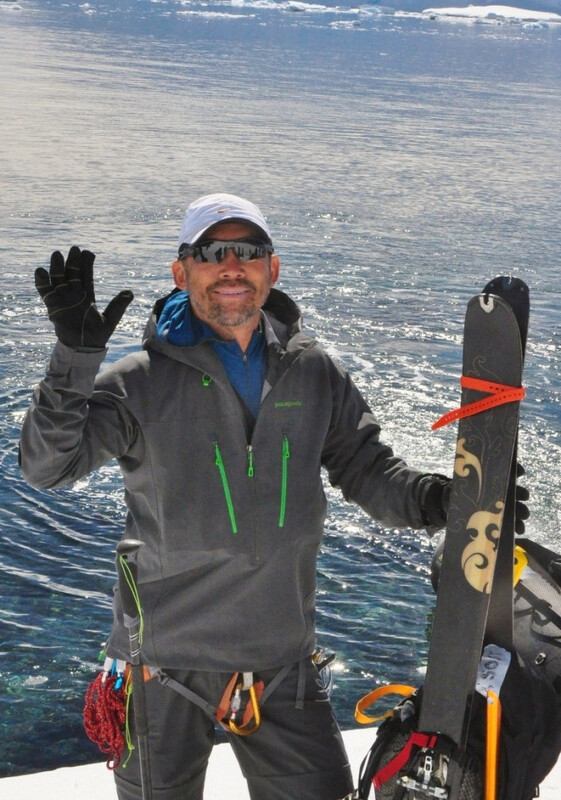 Baker to ski mountaineer. 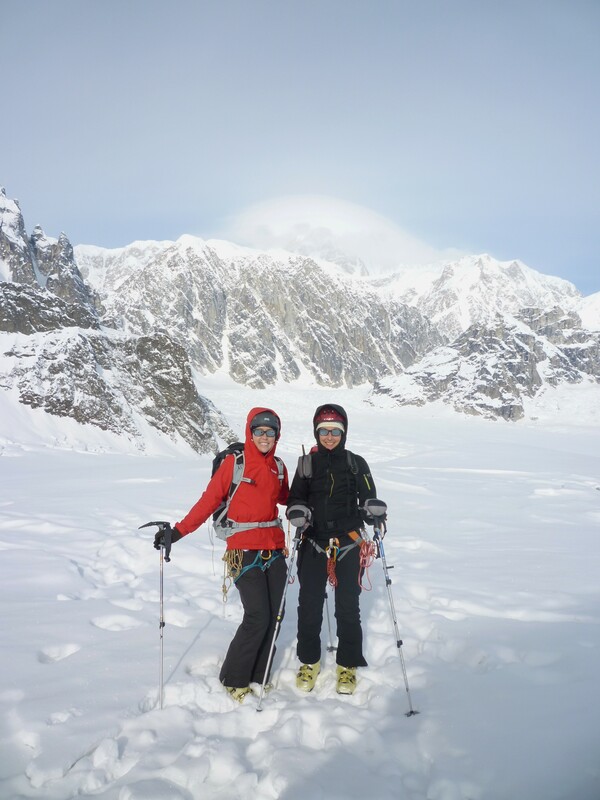 Mr. Shuksan is a striking mountain with classic ski mountaineering lines and extreme relief all around. Its big and extreme. I couldn’t access the classic line on the main face due to heavy brush and the snow melted out low. Also, I was by myself, so couldn’t really go up on the glaciers with the crevasse danger. 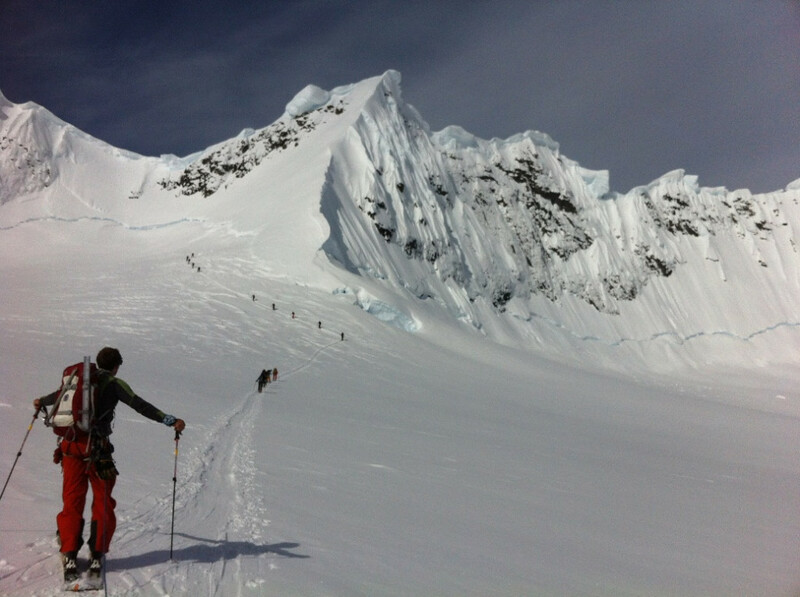 So Ptarmigan Ridge in the col between Shuksan and Baker where there was still 20 feet of snow presented a good option. 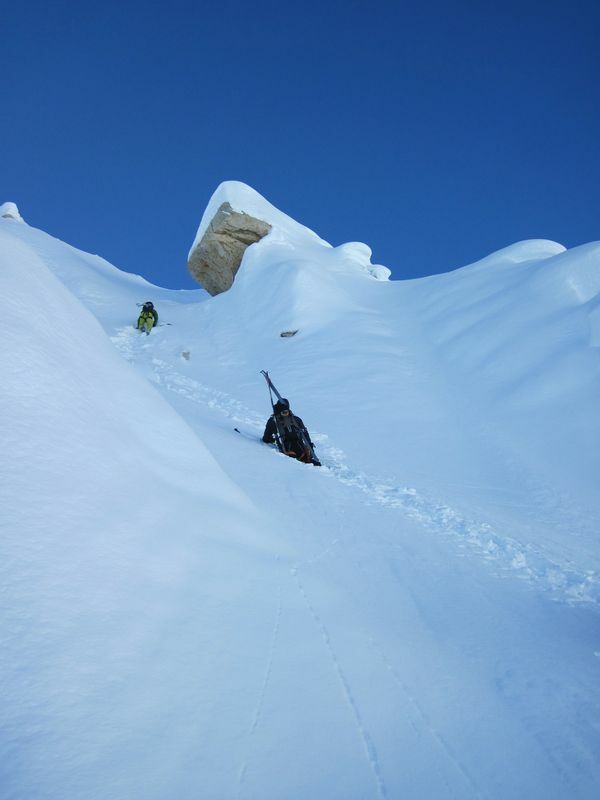 The snow had suncups and looked like lemon meringue pie making the skiing a bit bumpy. The weather was typically wet, but the sun peeked out a few times. The high tech waterproof lightweight breathable gear was like being a duck in the drizzle. I found a great bowl with lots of choices to ski. 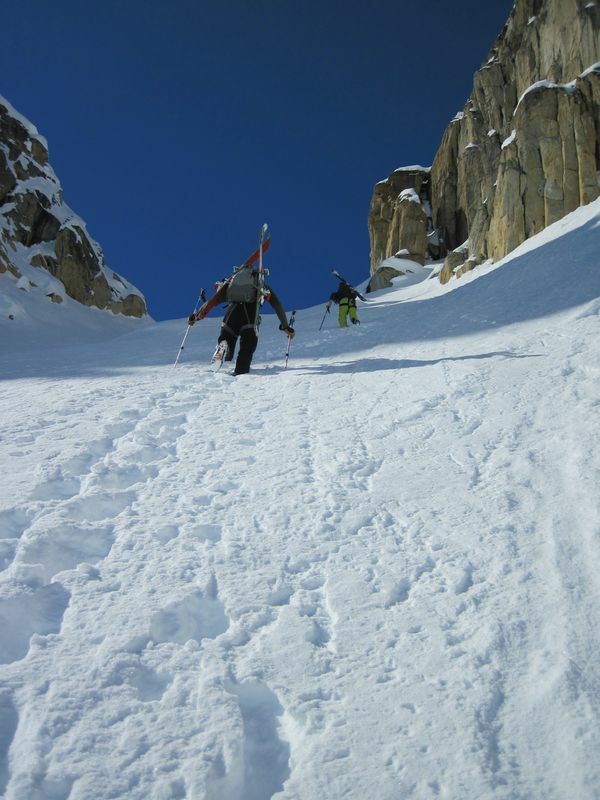 Here’s one of the nice steep lines, and yes its steep, then rolls over and gets steeper! Kind of spooky dropping in hoping it didn’t cliff out on the line. It was steep and bumpy so I took pretty easy. Falling was not an option if I wanted to walk out of there. It was about 1200 feet straight down. 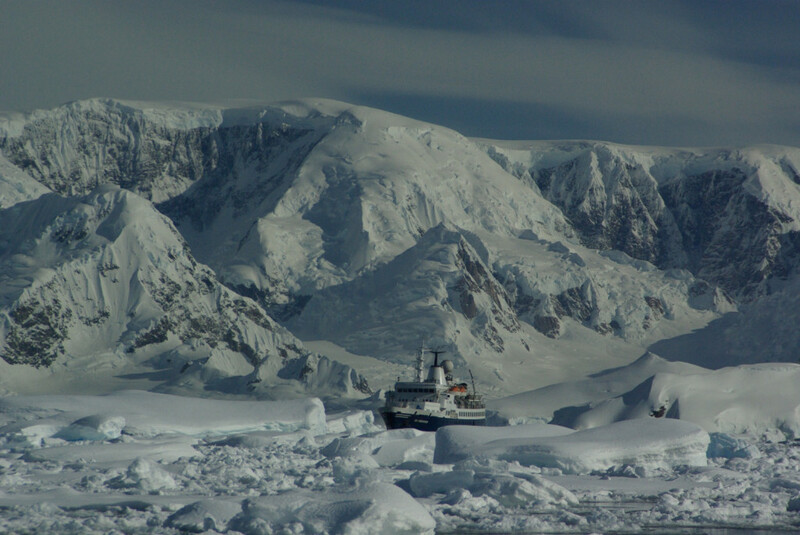 Next skiing will be Antarctica in November unless I can get to Chile in August.